Well, it just couldn’t get any worse for the Buffalo Sabres. After having one of the worst seasons in franchise history, the team learned Thursday that forward Zenon Konopka will be suspended for the first 20 games of the 2014-2015 NHL season. 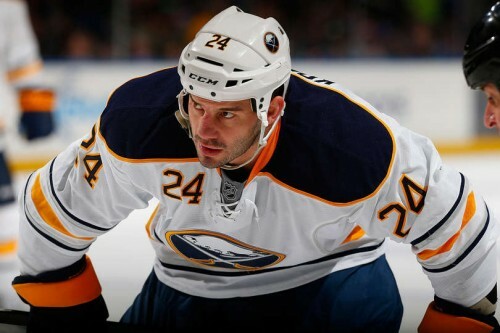 Konopka violated the league’s policy on using performance enhancing substances. Konopka was claimed off of waviers this year after playing the 1st part of the season with the Minnesota Wild. In 23 games with the Sabres, he had one assist and had a -4 plus/minus rating on the ice. The transition from the AHL to the NHL has not been easy for Konopka. In the AHL, he had 4 seasons of 15 or more goals. He had 55 and 57 pts respectively in his last 2 full AHL seasons. Since the 2009-2010 season, he has scored 8 goals total in a little over 300 games. Just 8 goals! Konopka released a statement saying that he was sorry for taking a substance. He is probably sorry for being caught. I do however commend him on owning up to the fact that he did make a mistake and didn’t lie about it like several baseball players (Ryan Braun, Roger Clemens, etc). He claims that he had bought an Over-The-Counter product and it contained a substance that caused him to test positive. In this era of drug testing in sports, wouldn’t it of made sense to CHECK the label or ask the pharmacist about what was in the product? Right now, Konopka is a free agent. Any team that signs him will have to have him sit the first 20 games of the 2014-2015 season. The Sabres should not re-sign him, they already have other players in the line-up who cannot score (Ville Leino, John Scott).